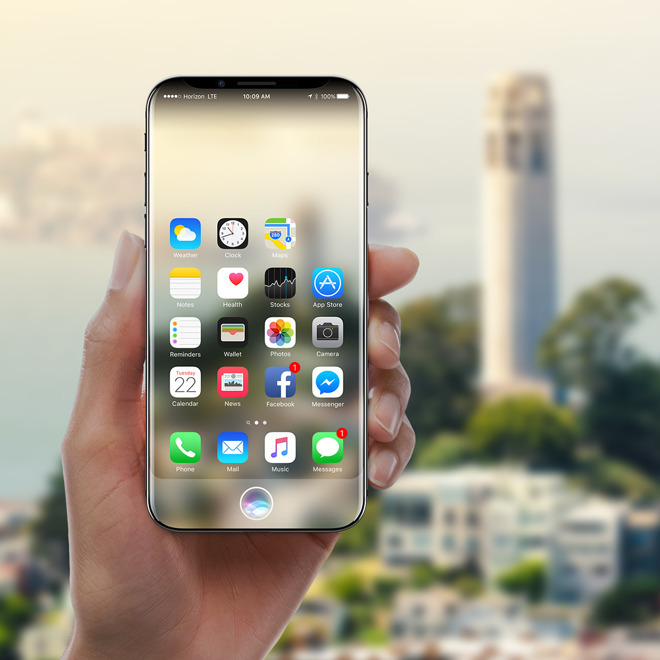 Apple is testing a variety of different technologies for this year's "iPhone 8," according to a report reaffirming many rumors about the phone's features, such as an edge-to-edge Samsung OLED display and new camera technology. In a more recent prototype, the screen itself is flat but with cover glass curving into a steel frame, Bloomberg reported on Tuesday, citing unnamed sources. This echoes multiple reports, including one from Japan on Monday. An earlier version of the same concept is said to have used a thinner band exposing more of the curved glass, while another allegedly sported more dramatic curves, much like the original 2007 iPhone. The latter may be the hardware referenced by a Korean report in March. Apple is likely to stick to mild curves because its suppliers have been having trouble producing steeper curves in large quantities, Bloomberg commented. While some prototypes have glass backs, the company is also said to be testing a design that ditches this for an iPhone 7-style aluminum back and bigger overall dimensions. The site's sources reiterated that while Apple is experimenting with embedding a fingerprint sensor into the screen, it's uncertain if that will make it into a shipping product —much like some recent analyst claims that Apple is having trouble with the technology. Perhaps more significantly, the sources supported rumors that Apple testing prototypes with a vertical dual-lens rear camera, and/or a dual-lens front camera —the latter of which could potentially be integrated into the screen. Both developments have been rumored previously, for instance by KGI Securities analyst Ming-Chi Kuo. Multiple front lenses could be used for features such as 3D facial recognition and/or iris scanning. Apple may further be experimenting with augmented reality and depth-of-field improvements. Because of supply problems, the "iPhone 8" may launch a month or two after Apple's normal fall window, Tuesday's report said, noting that in the meantime the company should be offering upgraded 4.7- and 5.5-inch LCD iPhones, similar to the iPhone 7 and 7 Plus. All three phones will reportedly run "iOS 11," and sport smaller, faster 10-nanometer processors —again, echoing earlier claims.